The CW’s delving into aliens on Earth with a revamped version of the 1999 fan fav, Roswell. 2019’s Roswell, New Mexico ups the ages of the lead characters introduced in Melinda Metz’ young adult Roswell High book series and adds in a murder mystery. Jeanine Mason and Nathan Dean Parsons take on the lead roles with support from Lily Cowles, Michael Vlamis, Michael Trevino, Tyler Blackburn, Heather Hemmens, Trevor St. John, and Karan Oberoi. Writer/executive producer/showrunner Carina Adly MacKenzie joined the cast at the New York Comic Con to tease the show’s first season. In our roundtable interview, MacKenzie talked about how the new series differs from the original show, bringing on some The Vampire Diaries/The Originals cast members, and the influence of social media on storytelling. 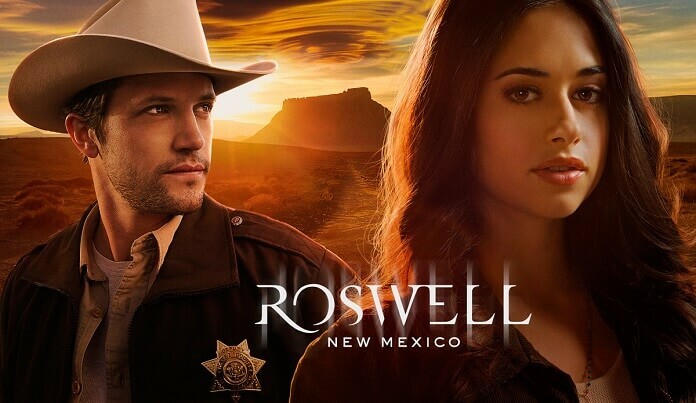 Roswell, New Mexico will premiere on January 15, 2019 at 9pm ET/PT. How many Easter eggs have you worked in? What were some of your inspirations going into the series, aside from the books? Carina Adly MacKenzie: “I love cowboys. Really, for me what it was was I was wrapping up my run on The Originals and they came to me and said, ‘Would you be interested in revamping Roswell?’ and I said no because I didn’t really want to do a teen supernatural romance. But I owed Warner Bros a pilot, so I wanted to go in and pitch them something. Julie Plec suggested I go in and pitch them the version that I would want to do. So, I made everybody grown-up. I just really wanted to do stories about what it feels like…I think that people talk about being on the cusp of adulthood as being 18, but in my experience being on the cusp of adulthood is being 28. Maybe that’s just the factor of being millennial, but I think that was when I really felt like I had one foot in childhood and one foot in adulthood. And so, I really wanted to tell that story. How do you think this series is going to resonate with fans of the original series? I hope that they like it. I hope that it feels like it honors the feeling of the original show. I think that what I was trying to do is the original show to me resonated so well because when you’re in high school everybody feels alone, everybody feels like a freak. And so I wanted to take that and raise the stakes a little bit because in adulthood right now, especially in this country, feeling alone and feeling like a person without a community means something different than it means in high school. The stakes are different. Not necessarily higher because what represents high stakes in high school is different from high stakes as an adult. That’s what I wanted to play with. What’s been it been like as a female showrunner with a strong, intelligent female lead? Has there been a lot of pressure in the climate today? Carina Adly MacKenzie: “No. Jeanine is brilliant and is so engaged. Jeanine and Nathan have really been partners for me in this process. We, during the pilot, had family dinners – the four of us with Julie Plec – and really dug into the script. We’d sit there and I’m crying about my daddy issues that I put into this scene, and then I’m like talking about my ex-boyfriend in this scene and really getting into the heart of what we’re trying to do. And so I think that we have an intelligent female character, an intelligent female actress, an intelligent female showrunner, really great female directors, and what we’re making is, I think, really good. How influenced are you by social media? Carina Adly MacKenzie: “A lot! I’m very influenced by it because I like to… I should say not necessarily by the fan aspect of it, but by the political aspect of it. I get into some of my most intelligent conversations on Twitter – also some of my least intelligent, for sure. But I’ve learned a lot. People like to put down social media and sort of turn up their nose at millennials being on their phones all the time, but we’ve gotten an opportunity to hear stories from people across the world that we never would have been able to hear stories from and engage with people that we never would be able to reach. So, I think a lot in my writing about how Twitter is going to respond because I think Twitter has become sort of the checks and balances for art. They will tell you if something’s problematic, which is good. We’re telling stories about race and immigration and sexuality and gender, and I think we are definitely going to step into territory that is scary to step into. So, I try to look at it from the perspective of Twitter and hope that I am telling stories that make people feel included. I was deeply, deeply affected a few years ago by the #BuryYourGays movement on Twitter which I thought was so important and changed the way that we talk in writers rooms and changed the way that we talk about a character’s fate, because a character becomes representative of something larger. That also led me to really avoid tokenism on my show. Will there be more cast members from The Vampire Diaries showing up? Carina Adly MacKenzie: “I don’t think so. Nathan and I worked together on The Originals. Trevino I have known since the very beginning of The Vampire Diaries because I covered The Vampire Diaries as a journalist. I was so nervous on set the first day and he came up and was like, ‘You look nervous. I’m Michael Trevino.’ We’ve been really good friends for like almost 10 years now. It’s funny because we’re right now shooting a flashback episode and Trevino walks in all clean shaven. I’m like, ‘Tyler Lockwood, how you been?’ (Laughing) It’s been really wonderful having everybody – Riley Voelkel – on board. She’s become a very big part of this season. Paul Wesley… Actually, he’s here. I had dinner with him last night. We both flew from Santa Fe on the same day because he’s directing for us right now.